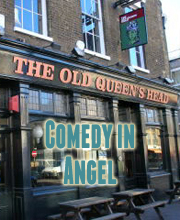 Laugh Out London returns to the Old Queen’s Head in Angel with another night of alternative comedy at an outstanding price. As seen on Comedy Central’s “Roast Battle” and “Live From the Comedy Store”. As Seen on Live from the BBC, Alternative Comedy Experience, 8 out of 10 Cats, Brexit Stage Left and soon to be seen on Live at the Apollo. Long time Laugh Out London favourite as seen on Live from the BBC, Alan Davies’ As Yet Untitled (DAVE) and The Russell Howard Hour (Sky 1).